2 of 6 In large skillet, heat bacon over medium-high heat until it begins to sizzle. Reduce heat to medium. Add onion; cook until softened, about 6 minutes. Add zucchini, rosemary, garlic, 1/4 teaspoon pepper and 1/8 teaspoon salt; cook until most of the liquid evaporates, about 5 minutes. 3 of 6 Remove skillet from heat. Add bread crumbs and Parmesan cheese to skillet; stir to mix. Transfer to small bowl. Wipe out skillet with paper toweling. 4 of 6 Season chops on both sides with salt and pepper. Using tip of a sharp knife, cut pocket in each chop, cutting all the way through to bone. Place packed 1/3 cup stuffing into each pocket, pressing gently to flatten. 5 of 6 In large nonstick skillet, heat oil over medium-high heat. Add 3 chops and brown, about 2 minutes per side. Transfer browned chops to large shallow roasting pan or 15 x 10 x 1-inch jelly-roll pan. Repeat with remaining chops, adding more oil if needed. Pour wine into roasting pan. 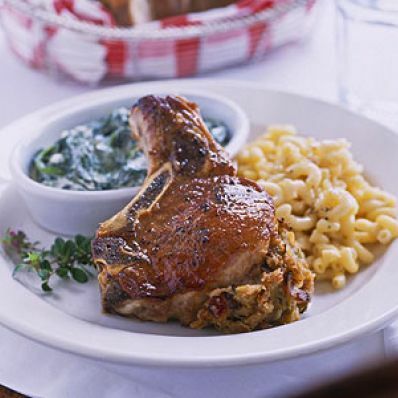 6 of 6 Bake chops in 350 degrees F oven 45 minutes or until instant-read thermometer inserted in thickest part of meat registers 150 degrees F to 155 degrees F. Remove from oven (internal temperature will increase to 160 degrees F). Serve warm.